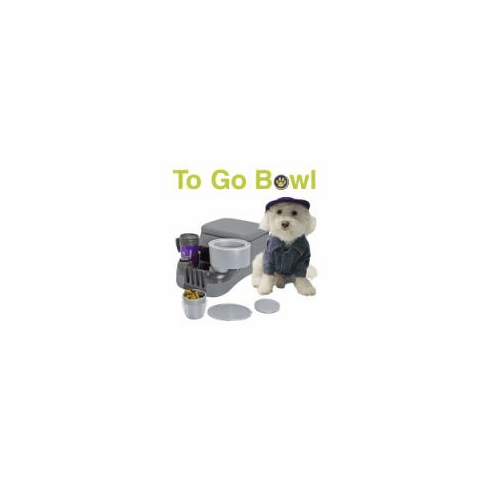 The To Go Bowl is created for dog owners who love to take road trips (as well as short car rides) with their furry companions. The To Go Bowl fits conveniently into your cars 3 to 4 inch (standard and x-large) cup holder and comes complete with a splashguard and lid to reduce spilling. And, the design of the To Go Bowl allows for storage of treats or dry dog food in its removable base. The To Go Bowl is an ideal and necessary travel tool: Your dog will stay well-hydrated throughout the trip without the frequent stops you previously require and since the bowl sits flat on the floor without its base, it easily transitions from the car to the hotel room, ground or home, wherever you are and wherever you are headed. The original To Go Bowl now fits extra large cup holders and standard size cup holders! The To Go Bowl is an ideal and necessary travel tool. Your pet will stay well-hydrated throughout the trip and you don’t have to stop frequently for drinking or food breaks; as you previously did. To Go Bowl fits into your vehicle's cup holder and also sits flat on the floor without its base to transition easily from the car to the hotel room, ground or home. The cup holder base can also be used to store treats and comes with a separate lid to keep treats fresh. For the smallest to largest breeds. Don't leave home without your TO GO BOWL! Made of FDA approved Polypropylene, the TO GO BOWL is dishwasher safe and proudly made in the USA. Patent Pending.